Good day for a fashion post…As mentioned on Instagram, I’ve lost weight and I’m down from 67kg on 30/12/2014 to 65.2kg today so very happy and most importantly, I’m feeling good. I still feel the aches from the abs workout on Wednesday but I also feel a lot stronger mentally. Following Kayla‘s plan, I’ve re-introduced grains in my nutrition plan (quinoa, rice, rye bread) and it keeps me full throughout the day. 1/ Mango has some great black trousers in the sale right now. My favourites are these high-waist biker trousers (featured above), these welt pocket leggings and these slim-fit trousers. 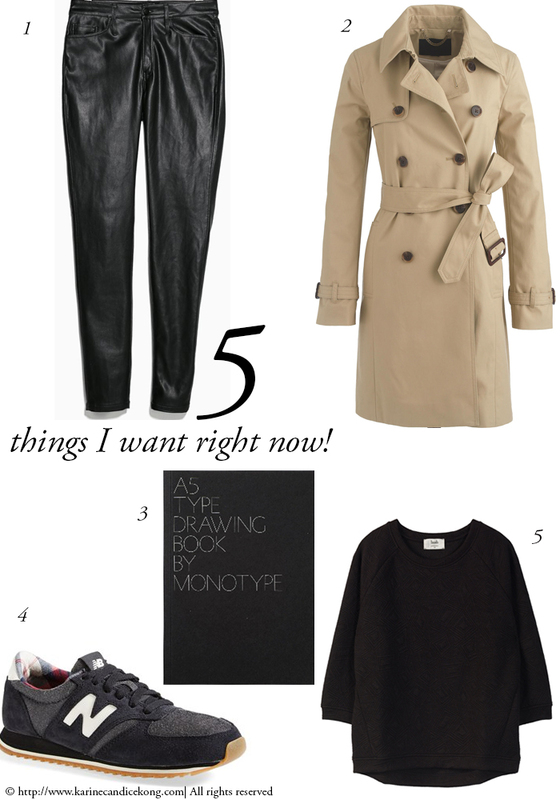 2/ In the 5 Things I want Right Now! last week, I mentioned my favourite trench from Burberry but if you are on a budget, GAP has a great classic trench in camel or navy. Personally, I’m also big fan of the J. Crew classic trench which is a happy compromise between the two above. 3/ I grabbed a few of couple of these Monotype notebooks in the BODIE and FOU Sale because I’m sucker for black notebooks and these are great and light to keep in my bag. 4/ and I really love this pair of New Balance available from Asos or Nordstrom if you are in the US. 5/ Since I discovered that Hush was doing lingerie, I’ve been obsessing a bit about this lace bra and this morning, I’ve treated myself this morning to the whole set to celebrate my little fitness/nutrition victory and this gorgeous quilted sweat top (a real bargain at £20!). Arghhhhhhh. These New Balance trainers are not on the Asos website and Nordstrom wont ship to UK! Where can I get them?